A crime commissioner has called on the Government to think about the "crippling impact" its cuts are having on policing after it was revealed that Hartlepool residents have taken to patrolling the streets to keep their property safe. 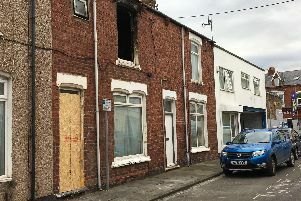 Barry Coppinger, police and crime commissioner (PCC) for Cleveland, was speaking after the Mail reported that volunteers in the Foggy Furze area said they have no option but to take to the streets in the middle of the night following cuts to police in the town. Almost every night, a handful of residents walk around the ward keeping an eye on homes, businesses and vehicles to try to ward off crooks. Resident Darren Price came up with the idea of running patrols in his community after reported increases in crime in the area. He said: “We feel we have no option, but to try to look after ourselves." It comes as a BBC report revealed there were no police officers in Hartlepool to respond to emergencies at one point last Saturday night due to all those on duty deployed elsewhere including having to transport suspects to Middlesbrough. Just this week Cleveland Police has launched a consultation on plans to close the Custody Suite at Hartlepool Police Station and transport suspects to be questioned in Middlesbrough when they are arrested. Mr Coppinger has called on residents to continue reporting crime in the area should they see it. “The report on BBC News about policing in Hartlepool highlighted the fantastic work our officers and staff do to keep us safe under increasingly difficult circumstances," said Mr Coppinger. "This happens all day and all night across the force area. "Whilst there are pressures on our response officers, there are other police resources working hard to keep Hartlepool safe – they work in neighbourhood policing teams; the Community Drugs Team; detectives work hard to investigate crimes, including domestic and sexual abuse; specialist officers and staff detect, prevent and investigate fraud and cybercrime - and we also have a growing network of volunteers and special constables. Hartlepool’s policing is supported from across Cleveland and the wider region, if required. “Chief Constable Mike Veale is reviewing the structure of the force, assessing where demand is highest and where the force can make efficiencies. “Data shows that arrests processed at Hartlepool custody have fallen by 65% since 2014, to just four a day on average. "Many of these individuals have complex vulnerabilities, which require specialist services. “Middlesbrough custody is a specially designed facility, equipped and supported by other services to assist detainees with mental health problems, substance misuse and alcohol issues. Many people arrested in Hartlepool are already looked after in Middlesbrough custody for this exact reason. “Analysis by Cleveland Police found that the average journey time to Hartlepool custody from another part of Hartlepool is 14 minutes, meaning a trip to Middlesbrough will only take an additional 15 minutes or so. “When I was presented with the Force’s proposals, I insisted on keeping this decision under review, ensuring the custody suite is mothballed rather than closed permanently, with the option to bring it back into service if necessary. “As PCC, my responsibility is to ensure that the impact on the community is taken into consideration and I will hold the Chief Constable to account on your behalf. “I would encourage any member of the public to report crime and concerns about community safety to the police. "Having viewed last night’s reporting, I think it is important to remind the public that they should not take the law into their own hands. “Cleveland Police appreciates the assistance of anyone willing to give up their spare time to keep people safe and the force are currently recruiting for additional Special Constables and volunteers to join their ranks. “Hartlepool Police Station will continue to be a beacon of policing in the centre of the town, housing Cleveland Police’s Directorate of Standards and Ethics and the innovative Integrated Neighbourhood Team. "All public services are bearing the brunt of austerity and sadly this has also increased pressure on policing. "As the Integrated team at Hartlepool shows, we have responded by working ever more closely with our partners - but as the coverage illustrates, policing is often the service of first and last resort. “I will keep engaging regularly with the community in Hartlepool and have supported various local projects such as youth diversion work at Belle Vue, which will be further developed as a result of successfully bidding for funding, work at Rift House, work with the Youth Offending Service, and projects such as crime prevention in vulnerable locations and Hartlepool Coastal Surveillance Centre through my Community Safety Initiative Fund. “While the BBC report may be a shock for many residents, it highlights the pressures on policing in Cleveland following eight years of austerity. “Central government funding to Cleveland Police has been cut by £39m (36%) in real terms over the past seven years, resulting in the loss of over 500 Police Officers and 50 Police Community Support Officers. “It was only by increasing the local police precept by £12 this year that we were able to prevent a further 60 job losses. “The Government must sit up and listen to what we are telling them about the crippling impact of their cuts on policing in Cleveland. “I have personally written to the Government and invited the Home Secretary to Cleveland to see first-hand the reality of police funding cuts. "I hope that he will do so.